Interesting ideas, James. I’ve been thinking about that myself, lately. If all believers finally come together under Messianic Judaism, what will the Gentile believers be doing? Tzitzit seems clear enough to me, but how much of what we do will be things like tearing the toilet paper on Friday morning; double sinks; hechsher on all foods even cucumbers (where you can clearly see there are no bugs); tefillin/kippot? Posing questions that would cross a rabbi’s eyes! Fortunately, Rav Yeshua will have the last word, unless there will be people who don’t want to listen. You write “When I say “us,” in one sense, I mean all Christians, but more specifically, I’m addressing we “Hebraically-aware” Gentile believers ” though the majority of people who call themselves Christian do not follow the teachings of the Nazarene rabbi Jeshua (Jesus Christ) and have made Jesus into their god, what real Christians can not accept, because we only may have One true God above all gods, and that is the Elohim Hashem Jehovah. Today we also may encounter a similar problem in Messianic groups that we do find groups which do not have Jeshua as their Messiah and others who claim to have Jeshua as their Messiah but also as their god. such trintiarian Messianics do not fit the Judaic faith nor real Christianity, though they may be counted to Christendom. You are right to find it very messy what we can find in Christendom, those claiming to be part of the Body of Christ as well as in Messianic Judaism. Real lovers of the Divine Creator God, should abstain from worldly human doctrine and should keep to Scriptural doctrines. so people should know there have always been real followers of Christ Jesus who do not adhere the false Trinity teachings introduced the 4th century. You write” One of the other things Messiah is supposed to do is interpret Torah correctly.” which seem to indicate you doubting Messiah Jeshua did so, but Jeshua very well knew the Torah and lived according it and demanded from his followers also to keep to God His commandments and following Scriptures more than human writings or teachings of man. I do not perceive James over years of reading to doubt that “… Messiah Jeshua did …” properly interpret Torah. I however do perceive you to be associated with Mark Santos — and thus not to believe that Jesus was actually a real person. It is not idolatry to believe a person is a person. This is aside from whether anyone is Trinitarian. that Yeshua M. carries throughout his life, that will prove to all that thou could not help other to save but by only helping yourself to save yourself is the big problem of the world they do not know. And also this is the reason why we are not recruiting but it is the Clouds who is observing. Please pass it on. Just came upon your post and your blog in the process of finishing a couple of posts on my own blog. One of the problems is Rabbinic Judaism, as opposed to Judaism (or Hebraism) as a whole. By focusing on Halakah (the law), mainly conduct and obedience, Rabbinical Judaism missed the opportunity to address more important religious matters that were significant in the Old Testament: morality, equality, protection of the poor and stranger,..etc. “Judaism beyond the kitchen” as Rabbi David Hartman said. Rabbinic Judaism isolated the Jewish Faith and did not prepare it for the modern world by spending tousands of hours arguing about minutiae. Poor choice of words on my part. I certainly do believe Rav Yeshua did correctly interpret the Torah and will do so again. As far as your statement regarding “human doctrine vs. Biblical doctrine,” this is a potential minefield, since the Bible is a very interpretable document. There’s a lot more to it than just reading the Bible in English, regardless of which translation you us. I used to go to a small Baptist church in my community, and the Pastor, who was intelligent, well-educated, and a nice guy, truly believed that his interpretation represented “sound doctrine” to the exclusion of all else, especially any sort of Hebraic understanding of the Apostolic scriptures. Once a person gets concrete about their doctrine, they can go tragically off course. The trick, naturally, is to continually study and question your assumptions. @Bernard Markowicz: Greetings. My personal understanding of the function of Talmud and halakah was that they were survival strategies to preserve Judaism. Without the Temple, the Priesthood, and access to Jerusalem and Israel, the Jewish people could have very easily assimiliated and disappeared thousands of years ago. I don’t believe God would have allowed that, but the strategy employed (I’m sure most or all observant Jews would object to my calling Talmud a “strategy”), allowed the Jewish people to have a focus for their praxis and thus enabled them as a people and a faith, to move forward in history. Regardless of my opinion on modern Jewish praxis, not being Jewish, and thus not being a covenant member (long story…read my essay, The Non-Covenant Relationship with God), I’m not obligated to the covenant conditions and praxis God provided for Israel, so halakah doesn’t apply to me except perhaps in some rare respects (donning a kippah upon entering a synagogue, for example). Thus, I’m not going to criticize Jews to feel obligated to modern Rabbinic praxis, either within our outside of Messianic Judaism. Also, because my wife is Jewish and not a believer (another long story), although she’s not particularly observant except in certain areas, I’m hesitant on a personal level to engage in that topic. I will say that regardless of how your Christian or Jewish faith is shaped and applied, it is my believe that Rav Yeshua will correctly interpret Torah for all of us, Jews and non-Jewish disciples alike, and I don’t believe for a split second that there is a devotee on Earth who has it all “right.” When our Rav corrects us, I hope we all can let go of our favorite sacred cow in grace and obedience. Yo, Bernie — There is no Judaism without Rabbinic Judaism or without halachah. 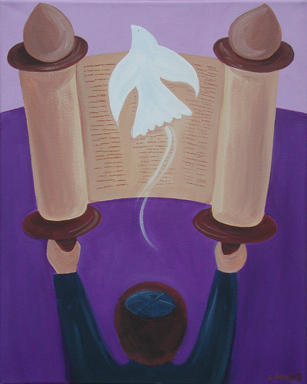 Halachah is the responsive portion of the conversation with HaShem that begins with His revelation of Torah. ‘Hazal did not ignore matters of morality as elucidated by the prophets of the Tenach. The discussions of Talmud or later Mishneh Torah did not miss any opportunities to address such matters. One really must know how to address the vast body of material in Jewish traditional literature. If some modern Hareidim fail to express or emphasize such matters properly it is a failure to understand the halachah and the literature on which it is based. There may be some truth to the saying that “the devil is in the details”; but one cannot avoid the devil by ignoring “minutiae”. All civilizations operate by laws that constrain behavior. The process of applying laws and rules and precedents cannot ignore the details that may arise in any individual case. Rav Yeshua himself addressed halachah in his discussions with various Pharisaic interlocutors, emphasizing its moral dimensions. Some Jews of recent generations have eschewed “the modern world” that you cite; but it is truer to say that the modern world has been just as hostile to Jews as the medieval world or the ancient world. Halachah is not the cause of that. Commitment to pursue obedience to HaShem is not the cause of that, except, perhaps, in the sense that the world hates the inherent criticism that it is guilty of not doing similarly. However, the above essay was examining to what degree non-Jews might do similarly to Jews despite not being constrained by the same covenant — and whether doing similarly also means doing in a different manner from the techniques and customs developed by Jews for Jews.